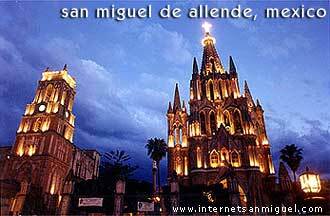 San Miguel Allende is one of Mexico's top 10 tourist destinations, and receives well over 100,000 tourists per year. It recently ranked fourth place in top tourist destinations by the Conde Nast Traveler Readers' Choice Awards, and has been the feature of dozens of articles in newspapers and magazines. San Miguel de Allende has two nearby international airports. The Aeropuerto del Bajio (airport code: BJX) is served by Continental Airlines, American Airlines, Aeromexico and Delta Airlines. The BJX airport is located 170 km (about 110 miles) from San Miguel, between the cities of Leon and Guanajuato, the state capital. The recently opened Aeropuerto Internacional de Queretaro (airport code: QRO) is about 70 km (40 miles) from San Miguel de Allende, is served by Continental Airlines and Aeromexico with once daily direct non-stop flights from Los Angeles (LAX) and Houston (HOU). A third option is the Benito Juarez Airport (airport code: MEX) in Mexico City, which is about 4 hours from San Miguel de Allende. The Mexico City airport has a larger choice of flights and is served by a broad range international airlines from across the world. In general, flights to Mexico City are cheaper than flights to BJX or QRO, however flying into Leon or Queretaro is considered more convenient. Many travelers prefer to arrange airport pickup through one of the local transportation services, because the drivers are not only bilingual, but since they are familiar with San Miguel de Allende, they can take you directly to the doorstep of the hotel, bed and breakfast, or vacation rental that you are staying in. Many of these same companies can also arrange to pick you up from Mexico City's Benito Juarez International Airport (MEX). To/From Mexico City: It's a 4-hour trip to San Miguel from Mexico City's Terminal Norte, on a first-class bus (with one stop in Queretaro). Primera Plus, Satelite, ETN, and Omnibus de Mexico all have one to six deluxe buses per day. Flecha Amarilla and Herradura de Plata have buses that leave almost every half hour (most are first-class). Make sure that your bus is a "directo". If you can't get a quick departure, catch a bus to Queretaro and change buses there. To/From Guanajuato: Flecha Amarilla has nine buses a day to San Miguel. To/From Queretaro: If you arrive in Queretaro by first-class bus, go out the front door and cross to the opposite terminal. Buses for San Miguel leave about every 20 minutes during the day, and every 1-2 hours in the evenings. You can choose between Satelite, Flecha Amarilla, and Herradura de Plata. The trip takes about one hour. To/From Laredo/Nuevo Laredo: Transportes de la Frontera/Estrella Blanca has a first-class bus that leaves Nuevo Laredo at 6:30 PM, arriving in San Miguel de Allende between 7 and 8 AM the next morning. The return bus leaves San Miguel at 7 PM and arrives in Nuevo Laredo around 7 AM. You can buy a ticket through Greyhound. There are also several smaller charter bus lines with offices in Laredo which specialize in carrying passengers to and from central Mexico to Laredo and points north. The prices are generally lower, but they can be crowded, and the bus's comfort and quality varies considerably from company to company. San Miguel de Allende's Central de Autobuses, (the bus station) is 1 1/2 miles west of town on the westward extension of calle Canal, called calzada de la estacion. Taxis from the bus station to the center of San Miguel are 20 pesos during the day and usually 25 pesos at night into town and available at all hours. Driving in Mexico can be a challenge, even for experienced drivers. Even the most modern highways weave through the mountains of Northern and Central Mexico. As a Texan friend once put it, "seems like the only roads in Mexico not going up are the ones going down..."
There are many modern toll roads (marked as "cuota") running throughout Mexico, however toll fees can add up quickly. It costs about US $70 in toll fees to drive from Nuevo Laredo to San Miguel de Allende. Before deciding to save money by taking the free highways (marked "libre"), do be aware that these roads are generally poorly maintained, and usually only 2 lanes, which means that you may find yourself trapped behind a slow moving truck for miles on winding roads with no possibility of passing safely, or forced onto the shoulder by oncoming	drivers who have lost their patience and decided to use your lane to pass. Speeding on the highways in Mexico is customary, possibly because of lax traffic enforcement. Drivers in Mexico tend to be remarkably aggressive compared to drivers in the US and Canada, so drive defensively. It is commonly expected that slower traffic will move to the right lane immediately. A small percentage of drivers will tailgate and/or use their left turn signal to demonstrate their impatience if the car in front of them does not change lanes quickly enough. This can be unnerving for inexperienced drivers, especially at speeds in excess of 80 miles per hour. Gasoline is generally more expensive in Mexico than in most parts of the United States, approximately $2.60 per gallon for unleaded ("Magna"), and $2.85 for super unleaded ("Premium"). All gas stations are "Pemex", as the petroleum industry is a government controlled monopoly. The strict majority of gas stations are cash only, and the farther from the border you go, the fewer will accept dollars. Be warned that in remote areas you may not find an ATM machine within 50 miles, so bring plenty of cash in pesos. Driving in the cities, the "uno por uno" (one by one) rule at intersections often deteriorates into whoever is bravest goes first, and usually that one is followed by another three. If you receive a parking citation, don't be surprised to find the car's front license plate removed, as well as a parking ticket under your windshield wiper. This is common practice in Mexico in order to ensure payment of parking citations. You'll have to go to the local transito (traffic police) office in order pay the fine and recover your plate. In order to enter Mexico with your own vehicle, you need to get a temporary import permit at the office of Aduana Mexico (the Mexican Customs Agency) at the Mexican side of border. You will need a valid driver's license and you must have ownership documentation, such as the original title or vehicle registration (it is also a very good idea to make extra copies of these documents and keep them in a safe place). You also must pay a permit fee of Mexican peso equivalent of US $27. In order to guarantee your car, this fee must be paid with a major credit card (American Express, Visa or Master Card). Unfortunately, checking account debit cards with the Visa or Master Card logo are not acceptable. If you don't have a major credit card, you must pay a sizeable cash bond, based on the model year of your vehicle. This bond is usually from $200 to $400, which is refunded upon leaving Mexico. Depending on the time of year, day of the week and time of day, it may take anywhere from 30 minutes to several hours to process the paperwork to enter the country with your vehicle. Starting in 2004, the process of importing your car can be done online at the banjercito.com.mx website or at some consulates located in the larger cities of states bordering Mexico. It costs more to process a vehicle for importation online or at a consulate, the current fee is US $39.60. Auto insurance is not required in Mexico, however, most US car insurance policies do not cover driving into Mexico, and the few that do limit coverage to within 50 miles inside the border. At either side of the border you will find insurance brokers selling Mexican car insurance. The coverage usually includes fees for a defense lawyer in the case of an accident. By law, the at fault driver is generally incarcerated until restitution is determined by a judge and paid to the victim(s), or a surety bond is posted for the estimated amount of restitution. Foreigners are usually considered flight risks, therefore an uninsured foreign motorist involved in a major accident might find it impossible to post bond, and for this reason alone, Mexican car insurance is very highly recommended, especially if your Spanish isn't very good. It is important to note that it is illegal to abandon a vehicle in Mexico, and it is also illegal to sell a vehicle with an temporary import visa to a Mexican. Also, it is against the law to allow a Mexican to drive your vehicle. The penalty for this violation can be the permanent confiscation of the vehicle (with no appeal). Finally, don't be surprised if you find periodic roadblocks, especially at state lines throughout Mexico. These might be manned by Federal or State Police, the Mexican anti-drug authority or even Mexican soldiers. These roadblocks are efforts to stop the flow of drugs, weapons and the trade of illegal wildlife. The best advice is to be as cooperative and honest as possible. Whatever you do - DO NOT SMUGGLE DRUGS OR WEAPONS! Foreigners receive no special treatment or immunity in the Mexican legal system, and drugs and weapons penalties are far stiffer than in the United States or Canada. This might be an appropriate moment to note that Mexico's laws, like those of France and Spain, are based on the Napoleonic code- that is, in contrast with the United States, persons accused of crimes are presumed guilty until proven innocent.